A modern technique known as laser cleaning has revealed an incredible facade into the historical legacy of the catacombs of St. Domitilla, after sifting through centuries of grime and dilapidation. 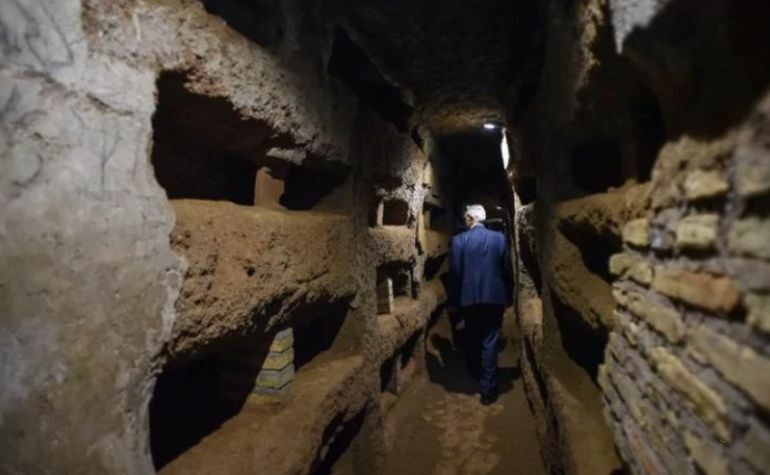 These 1,600-year old ancient catacombs (considered as one of the oldest Christian cemeteries) comprise a perplexing network of tunnels and underground caves that stretch for over 10 miles, thus amounting to a veritable labyrinth in the subterranean levels of Rome itself. 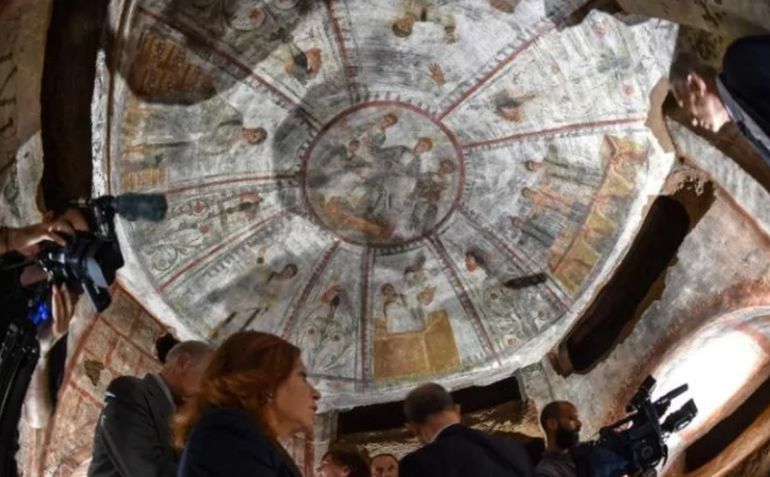 As for the recurrence of the historical legacy in question here, researchers from the Pontifical Commission for Sacred Archaeology were able to uncover fascinating frescoes in two separate areas of the catacombs. One of these sections pertains to the burial chamber of a wealthy grain purchaser (or ‘baker’ as mentioned in scholarly literature). As the laser cleaned off the soot and dust particles from the walls of the chamber, the researchers were witness to historical scenes of Rome’s grain-based economy. This entailed the portrayal of the high-ranking purchaser himself, draped in a ‘richly decorated tunic’, along with depictions of Rome’s grain trade and activities of the Annona, an office responsible for the purchase and distribution of Rome’s grain supply. These painted representations are complemented by a sylvan scene portraying the Shepherd and a resplendent setting that depicts none other than Jesus Christ seated on his throne, flanked by two groups of apostles. 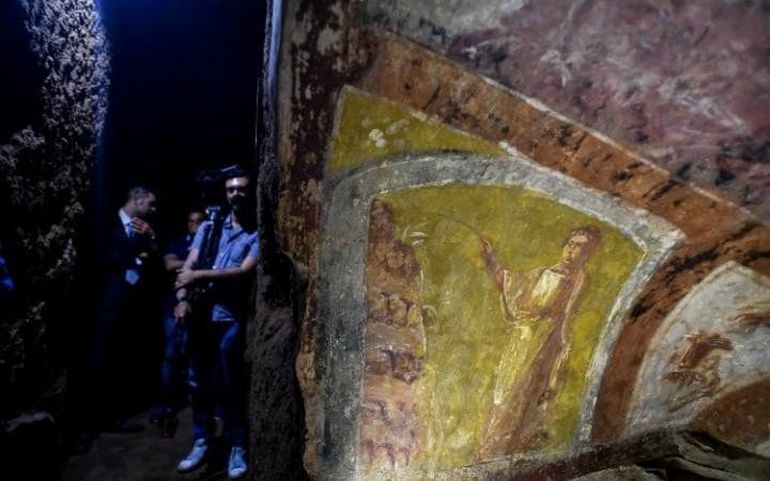 In another part of the catacombs of St. Domitilla, in proximity to the aforementioned burial chamber, a different fresco (also recently cleaned by laser technique) portrays Christ seated on a throne, but with a unique posture. The figure has his right arm raised before two deceased individuals and their patron saints, who are presumably ‘either the Princes of the apostles Peter and Paul (or St Nerius and St Achilleus), to be admitted in the Kingdom of Heaven’ – as mentioned by Barbara Mazzei, one of the archaeologists with the Pontifical Commission for Sacred Archaeology. 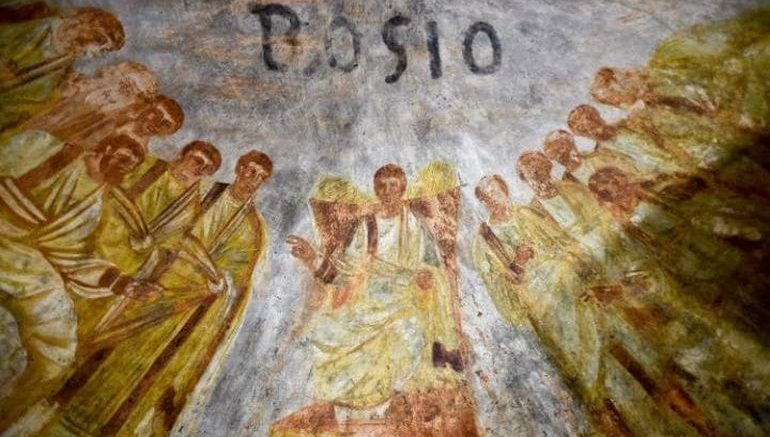 Mazzei also talked how the subject was quite rare when it comes to the overall scope of the catacomb paintings; but other scenes do entail episodes from both the Old and New Testaments, including Noah and his Ark and the miracle of Jesus’ feeding of the five thousand with bread and fishes. It’s a fusion of older pagan symbols with new Christian images. The family had only recently converted to Christianity. 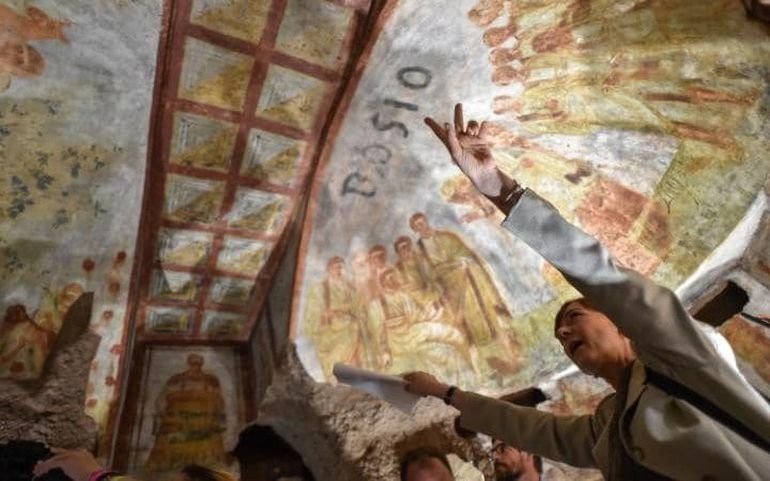 Lastly, the good news for history enthusiasts is that the researchers have just began to unravel many of the ancient frescoes with the aid of their laser cleaning technology. 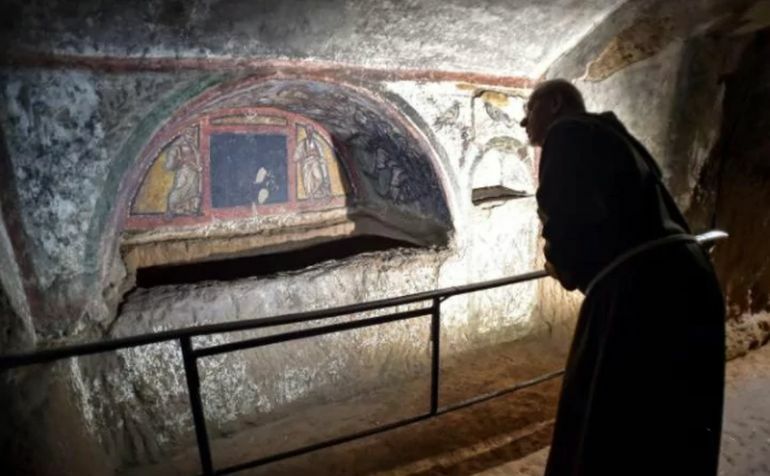 Simply put, we can look forward to the revealing of even more paintings in all their intricate glory from the subterranean labyrinths of St. Domitilla in the near future.